We are proud to be offering the opportunity to learn the art of taxidermy. During the schooling process you will have the option to learn mammals, life-size, fish, upland birds and habitat work. We will also cover business practices that will help you be successful. All students must supply their own horns and specimens for schooling. 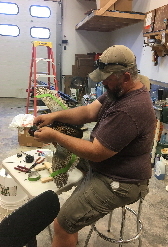 If you are interested in gaining an incredible amount of knowledge and coming out leaps and bounds ahead of taxidermists that have been doing it for years, please message us on Facebook for details or telephone Boudie at (406) 458-4877. We are looking forward to helping your dreams come true.